Many people opt for a Epionce skin peels to treat specific conditions, to rejuvenate the skin or for anti-ageing purposes. Skin peeling resurfaces the skin by removing layers of dead skin which can improve the skin tone, texture and minor blemishes. There are many different peels on the market and we have selected the safest and most customisable product to administer to our clients. We understand that each person’s skin is different and sensitivities vary. Our choice of peel allows us to cater to each individuals requirements with minimal risk on all ethnicities and skin types. What benefits can be seen? Improvement of fine lines and wrinkles. Skin feels smoother and firmer. Decrease in pigmentation (We do offer a specific pigment treatment). Reduction in bacteria and yeast which cause acne. Removal of excessive and stubborn blackheads. Removal of excess scaling to reveal tighter and brighter skin. Temporarily reduces excessive skin oil secretions. We initially cleanse the skin to remove dust, dirt and other environmental residues. Then we use a professional skin prep solution to strip the skin of any oils. Our Epionce chemical skin peels tailore the treatment to the individual, due to the fact sometimes we apply multiple layers. Furthermore, your therapist is experienced and watches to see how your skin reacts throughout the treatment. The peel acids consist of different pH’s also. Firstly, we start by applying a salicylic acid layer evenly over the skin and some individuals need only receive this to see drastic peeling. Your therapist will determine whether your skin reacts in a manner which does not require multiple layers. For some, the outcome you desire means applying multiple layers. Due to skin tolerance existing, either; by having peels regularly or naturally there is less surface build up. Post procedure the skin is cleansed and prepared for day to day exposure to environmental factors. 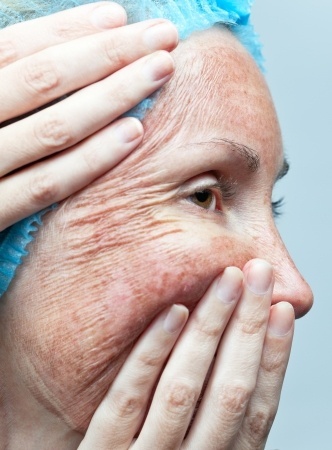 You may notice positive changes in your skin after just one treatment. However, depending on your skin care goals achieving the best results may require a number of treatments. Your therapist will recommend a Home Care Program (please see also our Aftercare Advice). It is recommended carrying out 6-8 sessions, to experience the full benefits of Epionce chemical skin peels. The interval between each treatment being at least 6 weeks. What should I consider before having a peel? Prior to having Epionce chemical skin peels, you should be aware that there is a certain amount of downtime required. Time is crucial for aftercare and hydration. Immediately after having a skin peel some clients may be pink and the skin will feel quite tight. This is due to the stimulation of collagen and elastin production. After 12-48 hours the skin may appear dry and possibly flaky/darker. Light flaking/peeling may be similar to sunburn in some people. If no peeling occurs this does not mean that the peel hasn’t been effective; this simply means that less dead cells are building up on the skin surface. The regulation of skin build up is efficient due to your own body mechanisms. This is also the case when an individual has chemical skin peels regularly. The production of collagen or elastin will have been roused on the skin surface by the peel. Over the years many clients have skin peels over smaller or larger body areas and observe beneficial results. How should I care for my skin immediately after my peel? It is essential that during the peeling process (which may last for up to 5-7 days) that the skin is kept well hydrated with mild cream/oil/moisturiser (we recommend the use of our Tone and Defence Skin Oil). Whenever the treatment area feels tight, you must apply the Tone and Defence Formula skin oil, this is due to the skin being dry. You must not prick or pull the skin whilst the peeling process is occurring. This is because new healthier skin is forming under the layers and the natural cell renewal process is occuring. The new skin appears when the body is ready. Active cold sores or warts are present. You have open wounds or damage to the skin surface. The skin is excessively sensitive. Individuals have dermatitis, eczema, or psoriasis. Inflammatory rosacea is an issue. Allergies to salicylates (such as aspirin) exist. A woman is pregnant or breastfeeding. Individuals are suffering from chronic depression or anxiety. We do not reccomend the epionce chemical skin peels if you’ve taken Accutane or have received chemotherapy/ radiation therapy within the last year. Avoid the use of electrolysis, waxing, depilatory creams, laser or any other professional treatment. If you are using any products which mean that Epionce chemical peels are not suitable, please inform us prior to booking. Also if you are undergoing any other treatment, please tell us. Stop using products such as Retin-A, Renova, Differin (Adapalene 0.1%) or Tazorac. Also do not use any products which may contain Retinol, AHA’s (alpha hydroxy acids) or BHA’s (beta hydroxy acids or benzyl peroxide). We provide you with information about aftercare prior to your booking and ensure you are medically suitable.